The Umbria region of central-Italy is the lesser-known neighbor of Tuscany. It is an ancient land, rich in history and beautiful experiences for all of your five senses. Umbria is hilly, tranquil and sure to meet all of your passionate expectations of Italy. The first sense you'll want to thrill in Umbria is your sense of taste. The wine and food offered here has a reputation that precedes itself. Umbria's food is known as being simple and original, built upon olive oil, pork and specialties to the region such as truffles (tartufos), which are highly coveted. Perugia, the capital city of Umbria, is famous for its chocolate. There are numerous restaurants to satisfy your tastes and many of them are family owned and operated. Much of Umbria is rural, the landscape being filled with medieval castles, fortresses and cathedrals. 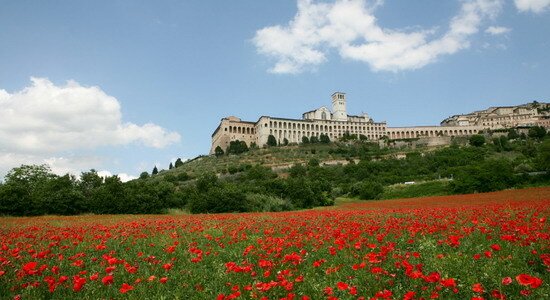 Umbria was the home of Saint Francis of Assisi; therefore, it has many spiritual and religious sites. Visitors can see Saint Francis of Assisi's tomb at the grandiose Basilica of San Francesco. The cathedral of Santa Maria Assunta in Spoleto, another stunning example of architecture with its famous rose window, is a must-see for visitors to Umbria. Any history enthusiast will be elated to travel in Umbria. The mark of the ancient Roman empire remains on the land. Age-old walls and towers dating back to the time of Caesar Augustus still stand. The ancient ruins of Carsulae, which was a rest stop for Roman soldiers and travelers that developed into a town, was established around 300 B.C. The area originally flourished because of its location along the ancient Roman road called the via Flaminia. Visitors to Carsulae will see the amphitheatre, two temples to unknown Roman gods, public baths and more. Umbria is also home to Lake Trasimeno, which also has much historical value. It is the site of a battle between Hannibal and two Roman legions. Castiglione del Lago is a ruined medieval castle on the lake built by Emperor Frederick II. Lake Trasimeno is breathtakingly beautiful. There are many campsites around the lake from which to embark on explorations of the surrounding area. Travelers to Umbria will find many different kinds of places to stay during their trip. There is something for every type of traveler, from rustic villas to hotels to family-run bed and breakfasts. Many accommodations offer a restaurant on-site or a fully equipped kitchen to allow you to create your own Umbrian feast. Even while enjoying the relaxation of a country-side retreat, modern amenities are available to allow the best of both worlds, old and new. The Umbria region of Italy is captivatingly charming and warmly welcoming. Any traveler will simply fall in love with this beautiful and lush part of Italy. Scott Rivers lives in Costa Rica and is also a lead writer for Costa Rica Sunsets, an adventurous travel agency in the country.